In 1939 Nazi Germany launched an expedition to the portion of Antarctica lying south of Africa. Alarmed at the prospect of territorial claims President Franklin Roosevelt established the U.S. Antarctic Service and designated Admiral Byrd as commanding officer. For the first time Congress authorized partial funding for one of Byrd’s expeditions. Byrd assembled two ships, the Bear of Oakland from BAE II and the USS North Star. He also took two airplanes, the Condor from BAE II and a Beechcraft. They established two bases, a West Base on the Ross Ice Shelf called Little America III and an East Base on Stonington Island on the Palmer Peninsula. 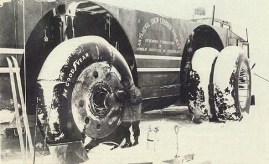 One of the interesting additions to the expedition was the Antarctic Snow Cruiser, a huge vehicle 55 feet long, 20 feet wide, and equipped with wheels 10 feet in diameter. 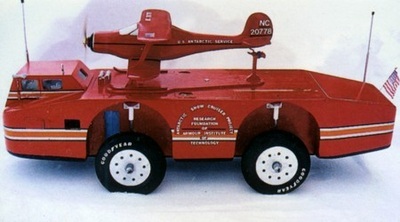 The Cruiser could carry a small airplane on top and carried enough fuel for a 5,000 mile range. Unfortunately the Cruiser was a big flop on the snow. The expedition mapped a thousand miles of coastline between the two bases. Scientific studies were carried out in geology, biology, cosmic rays, and other disciplines and recommendations were made on types of cold weather clothing and gear. American flags and benchmarks were left throughout the newly explored territory which was unofficially claimed for the United States. In 1940 Nazi panzers and Luftwaffe units were storming across Europe. With the prospect of war looming the expedition was recalled much to the disappointment of Byrd who wanted to see permanent year around bases established on the continent.